The Gordon College Department of Theatre Arts presents its winter production, The Mystery of Edwin Drood, interactive murder mystery musical in which the audience ultimately decides “whodunnit.” Directed by Professor Jeffrey Miller with musical direction by Instructor in Music Jessica Modaff, The Mystery of Edwin Drood runs January 25 through February 2. Set in 1870 at the Music Hall Royale in England, a group of actors performs a production of The Mystery of Edwin Drood. In the show within a show, young Edwin Drood has been murdered. But who committed the crime? The charming John Jasper? The charismatic and secretive Princess Puffer? The mysterious Landless Twins? Someone even more nefarious? Only the audience can decide. Join the company for a metatheatrical evening full of laughter, excitement and multiple possible endings. The Mystery of Edwin Drood is performed by an ensemble of 21 Gordon College students. Performances will be held in The Margret Jensen Theatre, a blackbox theatre that creates an intimate and engaging theatrical experience. Written by Rupert Holmes (Curtains, Escape: The Piña Colada Song), The Mystery of Edwin Drood first premiered on Broadway in 1985 and won five Tony Awards, including Best Musical. The musical is based on Charles Dickens’ unfinished novel of the same name. The Mystery of Edwin Drood was recently revived on Broadway in 2012 at the Roundabout Theatre Company. The production featured notable actors Chita Rivera, Will Chase, Stephanie J. Block, Andy Karl, Jessie Mueller, Betsy Wolfe and Jim Norton. The 2012 revival was nominated for five Tony Awards. 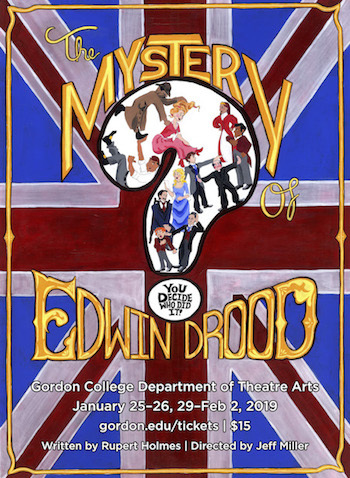 The Mystery of Edwin Drood is the second production of The Gordon College Theatre Department’s 2018-2019 mainstage season and will be followed in the spring by the Mini-Fringe Festival: The Unknown Unknown, supervised by Jeffrey Miller.